I have been out of the blogging world for quite a while now. Thanks to everyone who has commented on my site and sent me requests! I have some down time in my normally busy schedule so I wanted to get some posts out from my trips last year. Last year flew by for me but also seemed to take a lifetime - I found out I was pregnant in April so my year was filled with everything pregnancy related. Luckily, we still managed to fit in a few trips between morning sickness and a growing belly. This area in northern Italy is known as the lakes region. There are many lakes but the largest and most famous are Lake Garda, Lake Como, Lake Maggiore, and Lake Iseo. They are all situated in the Lombardy region and will quickly whisk all your troubles away. They are also huge and at least at Lake Garda and Como it's impossible to see across the entire lake. If you didn't know any better you could very well think they are part of an ocean or larger body of water (except for the lack of salt water). I did end up going back to Lake Garda two more times and have now visited Lake Como twice. We already have plans to go again this year and have had serious chats about buying a vacation/rental home there. Did you know? Lake Como is about 29 miles long and is as wide as 2.5 miles across in some areas. Around Lake Como there are many small villages, each one unique yet retaining their own sort of charm. 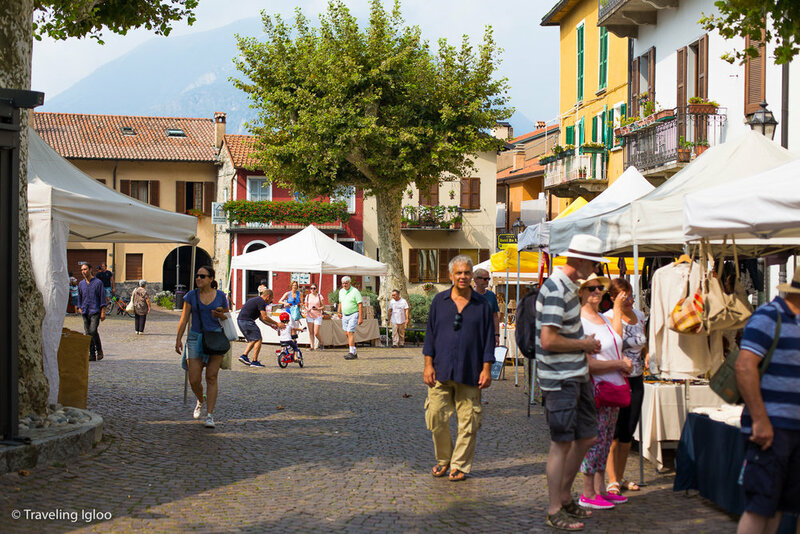 The most popular are Varenna and Bellagio (Menaggio is also quite popular as well). They stand out in their beauty and have something special about each of them. These three towns get the most ferry traffic and have the most to offer in terms of restaurants, shops, things to do, etc. They are also all located in close proximity to one another and form a triangle in the center of the lake, making it convenient to visit all three while there. If you're driving there is a car ferry and it's fairly cheap - just keep in mind that even though this is a touristy area the ferries don't run too often and stops in the early evening. When you read elsewhere on the internet that you can't go wrong staying at any of these towns, that is correct. Especially if this is your first time to Como. If I had a preference, though, it would be in this order: Varenna, Bellagio, then Menaggio. This is also evident by the many other people who stay on the lake and is also reflected in hotel prices. We will start with my favorite town of Varenna, which also happens to be everyone's favorite. This village is chock full of winding narrow stairways and a plethora of shops and restaurants. Visitors can lounge at one of the many patio areas and enjoy a nice glass of vino along with their pasta or pizza dish. These towns are very laid back and peaceful, and incredibly romantic. If ever you needed a place to fall in love again, Lake Como would be my top pick. We visited a villa in Varenna called Villa Monastero. This was the first and only villa I've visited so I have no idea how it compares, although from a boat trip we did I think there are other, more glamorous villas at other areas around the lake. However, I think this one still is worth a visit. It has a large botanical gardens area and a house museum as well. If you want to enjoy it all I'd say give yourself at least 90 minutes (not including walking to or from the villa from Varenna). The villa is in Varenna and located at the top of the hill or town past the main square. If you visit Varenna I would add this to the list of must see places. It was inexpensive and conveniently located as well. When to Visit? When we went in April there were few tourists and it wasn't crowded at all. The weather was also quite nice with temps in the high 60's/low 70's (F). It wasn't warm enough to swim but since I don't like hot weather this was perfect for me! We went again for Labor Day in September and it was really warm out, probably in the low to mid 80's (F) with decent humidity. We stayed in Bellano in the fall, a village along the same side as Varenna, and went swimming at the local beach everyday. If you want a town with a beach be sure to research this as not every town has one. Also known as the "Pearl of the Lake", Bellagio is the largest of these three towns. It is a hilly town full of pedestrian cobblestone walkways lined with artists and shops galore. And of course, don't forget about the wine! Above left: We found a nice little restaurant with fantastic wine tucked away on the water. When we went in April it wasn't quite tourist season yet so we had no problems getting a spot outside. When we went in the spring we stayed in Menaggio. Since we went in April it was still off season so we were able to land a great hotel at a really good price. The prices were good and we were able to get a fantastic lakefront hotel room at Hotel Bellavista with a balcony as large as our room. We paid about 130 Euro per night for the upgraded balcony room. If you don't want to pay extra for the balcony I think the prices were about 30 Euro less per night. Not bad for lakefront on Lake Como. Below: View of Menaggio as we headed to Bellagio. Even though it was April the weather was quite nice. It wasn't warm enough to swim but nice nonetheless. The center of Menaggio isn't hilly like the other two towns and doesn't have quite the same amount of charm. It is still a cute little town with some restaurants and shops. One night we went to a bar near our hotel and they were doing country line dancing in the dance area. COUNTRY LINE DANCING IN LAKE COMO. And, these people were really good! I think this was one of my favorite parts of the weekend and can be chalked up to another one of the random and amazing things about living in Europe. Below: view from our balcony. Below: View from the other side of our balcony. Check out the snow capped mountain in the back! Below: One of the many cafes in Menaggio. Ciao for now Lake Como - I can't wait to see you again!